When I decided to write the book that would become How to Fall in Love With Anyone, I really struggled with the question of form. I knew I wanted to write about love stories. I knew the idea — an exploration of the gap between how we talk about love and how we actually practice it — was big enough for a book. I wanted the book to be both personal and well-researched. But what will it look like? I kept wondering. What exactly will it contain? I could sense the forest, but there were no trees. Book-length personal narratives are often classified as memoir, but memoirs are about people’s lives and my book wasn’t really about me. My experience was just a starting point, a way into bigger questions about the role of love stories in our lives. It didn’t occur to me to write essays, even though the essay was the form I most loved to read, because I thought you had to be Joan Didion or Zadie Smith or Barbara Kingsolver to publish a collection of essays. In other words, you had to be something else — a novelist or a screenwriter or, ideally, Nora Ephron — before you were allowed to set your thoughts loose on an idea, page after page. You couldn’t just be an essayist. But luckily I was wrong. In the intervening five or six years, websites like the Rumpus and Salon and Slate popularized first-person nonfiction; Facebook and Twitter made the form especially easy to circulate and consume. By the time I was ready to pitch my book, Roxane Gay and Leslie Jamison had put essays on the bestseller lists. I remember a trip to Portland that year, standing in the essay aisle at Powell’s with a copy of The Empathy Exams in hand. I stared at the shelf and tried to imagine my still-formless manuscript as an actual book with a cover and an ISBN, propped up there by David Foster Wallace and Marilynne Robinson. I longed to write essays the way kids long to have puppies. I wanted to be the kind of person whose job it was to wander around in ideas. I tell my students that an essay, in the classic sense of the word, is really an exercise — something you do, not something you produce. It’s related to the word assay, meaning “to try.” And maybe this is what makes the form particularly well suited to writing about love. In essays, as in love, the interesting part is the trying. The only problem with the essay is that discovery won’t be rushed. I spent years weaving and unweaving the story of my parents’ marriage. I have a tattoo on my forearm; it’s my favorite etymological beginning: the Latin verb texere, meaning “to weave,” from which we get text, and textile, and texture. I love this idea of a piece of writing — a text — having texture, having been woven. Is writing essays really like weaving? The impulse — to assemble, to entwine, to make something that might be durable and even beautiful — seems the same. In this way, too, love and essays are both characterized by their capacity, by all they can carry, despite apparent limitations. One of the essays in my book begins with a passage that is essentially fiction: a scene imagining the day my parents first met. If there is one fixed rule for writing essays, it’s that they must be true. And now I’ve broken it, and asked the form to contain pure speculation. It seems to be working. This particular passage is probably the only thing I’ve ever written that needed almost no revision or editing. I suspect this is because I was so enamored of my parents’ love story that I’d spent 30 years editing its opening scene in my mind. When I sat down at my computer, it appeared on the page, clean and whole and breathing. The scene was the beginning of an idea (that divorce was the wrong ending to this particular love story) that became a question (had I missed something in their story, some clue to its unexpected ending?) that eventually became an essay. Maybe I like the essay because I am, at heart, an agnostic. I am skeptical of certainty, of shortcuts, of easy answers and overconfidence — both in love and in writing. And yet, I think we are each obligated (in loving and in essaying) to try, to be curious. The best essays offer a sort of rigorous honesty, by which I mean they endeavor to say the thing that is most true — not the thing the reader likes to hear, or the thing that sounds true, or the thing the writer wishes to be true. This is a particularly difficult thing to do. But I think it’s what real curiosity looks like. If I learned anything from researching and writing this book, it’s that I spent much of my life approaching love with a sort of willful ignorance. I wanted love to be unknowable and mysterious. As strange as it seems, writing essays has made me a little bit better at love — and I don’t mean the content of the essays (though I have learned a lot); I mean practicing the form itself. It has taught me to be less willful and more accepting of uncertainty, more curious, more open to trying. 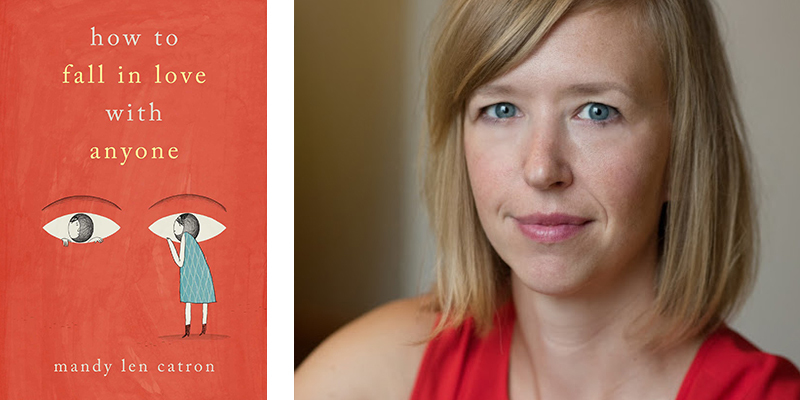 Mandy Len Catron, originally from Appalachian Virginia, is a writer living and working in Vancouver, British Columbia. She’s writing about love and love stories at The Love Story Project. She teaches English and creative writing at the University of British Columbia. Her article "To Fall in Love With Anyone, Do This" was one of the most popular articles published by the New York Times in 2015. How to Fall in Love With Anyone is her first book.